During the session of the Parliamentary Assembly of the Council of Europe, the delegation of Ukrainian human rights defenders, diplomats and journalists will deliver a speech about the situation with freedom of speech in Crimea. 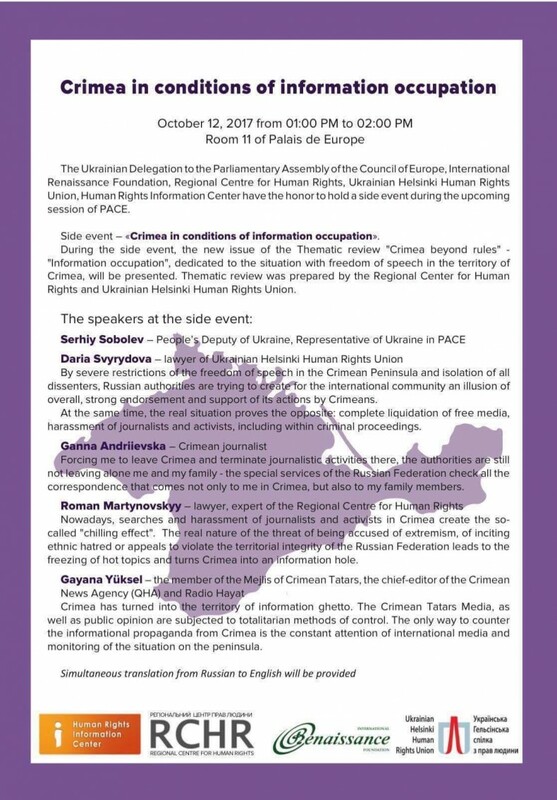 Their presentations will be held during the side-event “Crimea in conditions of information occupation”. Within the framework of the event, a new issue of “Crimea without Rules” – “Information Occupation”, dedicated to freedom of speech in Crimea, will be presented. The report was prepared by the Regional Human Rights Center (RHRC) and the Ukrainian Helsinki Human Rights Union. The event will be attended by speakers from UHHRU, RHRC, the official Ukrainian delegation to PACE, the Mejlis of the Crimean Tatar people, the International Renaissance Foundation, the Human Rights Information Center and journalists. “After the recent statements made by Czech President Zeman on the “sale” of Crimea and attempts to return the Russian delegation to PACE, it is important to continue to inform the Council of Europe about the consequences of Russia’s occupation of the peninsula”, the representatives of the Human Rights Information Center have emphasized on the eve. Please find the program of the event in English below.